Devart Excel Add-ins allow you to work with database and cloud data in Microsoft Excel as with usual Excel spreadsheets. With Devart Excel Add-ins you can get exactly the data you need with visual Query Builder or with SQL and refresh the queried external data in a workbook any time with a single click. External data can be edited as you usually do it in Excel, and then saved back to the data source. Devart Excel Add-ins allow you to precisely configure what data to load into the document. They allow selecting objects and columns and setting complex data filters. If this is not enough, all the power of SQL is to your service, not only for relational databases, but for cloud applications too! The main Devart Excel Add-ins benefit is that it allows you to periodically get the actual data from different data sources to Excel with a single click without repeating the whole import operation each time. 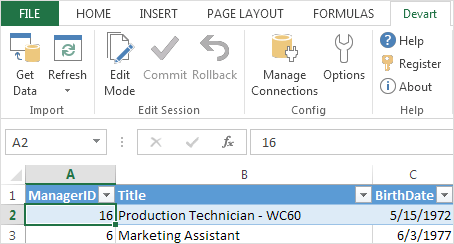 You can refresh data in your workbook easily whenever you want. Send us a link to your MVP profile and get a free license for any Devart SSIS DataFlow Components! You can get a significant discount, and even a free license, by spreading a word about Devart Excel Add-ins. High-performance and feature-rich connectivity solutions for ODBC-based apps to access cloud and database data from Windows, macOS, Linux.